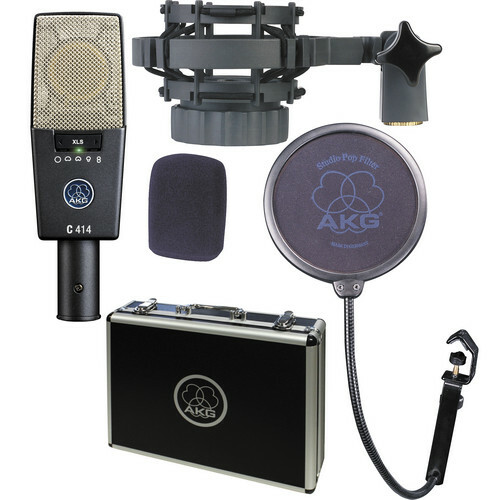 The classic C414 XLS Multi-Pattern Large-Diaphragm Condenser Microphone from AKG is a staple within the audio industry. Equipped with nine selectable polar patterns, three attenuation levels and three switchable bass-cut filters, the C414 XLS remains one of the most versatile condenser microphones for recording vocals, drums, and acoustic & amplified instruments in the studio or on stage. This microphone is designed to closely approximate the sonic character of the vintage C414 B-ULS. The 1" edge-terminated dual-diaphragm transducer combined with the low-noise electronic circuitry provide a wide dynamic range of 134 dB and can handle SPL up to 158 dB, for a detailed and natural sound. Features include a peak-hold LED to alert you if overload peaks occur, and a Lock Mode so the microphone settings cannot be changed unintentionally. The elastic capsule suspension minimizes structurally transmitted noise from chassis vibration. The rugged all-metal body ensures efficient rejection of RF interference and makes this microphone well suited to withstand the rigors of studio and stage handling. Built and designed in Austria, the C414 XLS comes with a metal carrying case, a spider-type shockmount, a pop filter, and a foam windscreen. Box Dimensions (LxWxH) 11.3 x 8.8 x 5.3"
C414 XLS Multi-Pattern Large-Diaphragm Condenser Microphone is rated 4.5 out of 5 by 4. Rated 4 out of 5 by Mink Rockmoore from This mic works for almost everything Great for guitar, strong vocal especially. Use NeumannU87 for softer vocies. Rated 5 out of 5 by Boecker from it's called a standard nice mic, warm sound, a standard in every studio.